Background: The intubation difficulty of using the flexible FOB could be due to the inability to visualize the glottis and/or failure to advance and railroad the endotracheal tube. The combined use of Macintosh laryngoscope with the flexible FOB could be a safe technique that facilitate the flexible FOB intubation function in non-relaxed spontaneously breathing patients predicted to be difficult for endotracheal intubation. Methods: A prospective randomized controlled study included 100 patients predicted to be difficult for airway intubation, ASA physical status Ӏ-III, aging 18-65 years. Patients were randomly allocated into two groups 50 patients each, the control group (Group F) in which flexible- video assisted-FOB was used alone and the study group (Group MF) in which combined Macintosh - flexible-video assisted-FOB used for endotracheal intubation under inhalational general anesthesia out of any muscle relaxant use. The study compared the techniques for endotracheal tube insertion time, 1st trial success rate, number of attempts, complications, and hemodynamic changes between both groups. Results: There were significant decrease in endotracheal tube insertion time Group MF (32.1 ± 7.9) compared to Group F (68.6 ± 12.6), significant increase in 1st trial success in Group MF 49 (98%) compared to Group F 43 (86%), with acceptable Intubation conditions and hemodynamics for both groups. Conclusion: The combined use of Macintosh laryngoscope with the flexible FOB in predicted difficult endotracheal intubation conditions provides significant decrease in endotracheal tube insertion time (near 50% reduction), significant increase in 1st endotracheal intubation trial success rate, acceptable intubating conditions and hemodynamic stability compared to flexible FOB alone. a. The Study Question: Could preliminary Macintosh laryngoscopy improve the performance of flexible Fiberoptic Video Assisted Laryngoscope (FVFOB) during predicted difficult intubation? b. The study Value: Up till now this is the only clinical research studied the value of combine FOI with Macintosh laryngoscope in difficult intubation predicted airway. c. The Study Findings: Combined Macintosh with FVFOB provided Significant decrease in EET insertion time, significant increase in 1st trial success, accepted Intubation conditions, and hemodynamics during predicted difficult intubation. d. Meaning: Macintosh laryngoscope with the FVFOB is feasible and safe intubation technique in spontaneously breathing non-relaxed patients having predicted difficult airway intubation (PDEtt). The combined use of Macintosh laryngoscope with the FVFOB can facilitate the FOB intubating function and increases its success rate in non-relaxed spontaneously breathing patients PDEtt. Aim of the work: To improve flexible FOB reliability and success rate during difficult intubation conditions. After study protocol approval by the Human Studies Committee at the University Mansoura International research board approved, this study (IRB) Code Number: R/17.08.102, date 10/9/2017, written informed consent was obtained from all subjects participating in the trial, the trial was registered prior to patient enrolment at the ClinicalTrials.gov (NCT03310866), registration date 16/10/ 2017. A prospective randomized controlled study on Patients aged 18 to 65years of ASA physical status I to III. All Patients airway was evaluated by NT-MMT airway score (2) and thyromental distance (3) by anesthetists not involved in airway intubation at the preoperative round. The study was designed as a parallel 2-arm, comparing FVFOB [KARL STORZ (FIVE) Flexible Intubation Video Endoscope, C-MAC® Monitor, 8403, zx] (control group=Group F) versus combined FVFOB and Macintosh laryngoscope (study group= Group MF) for PDEtt scheduled for oncology surgery under general anesthesia. 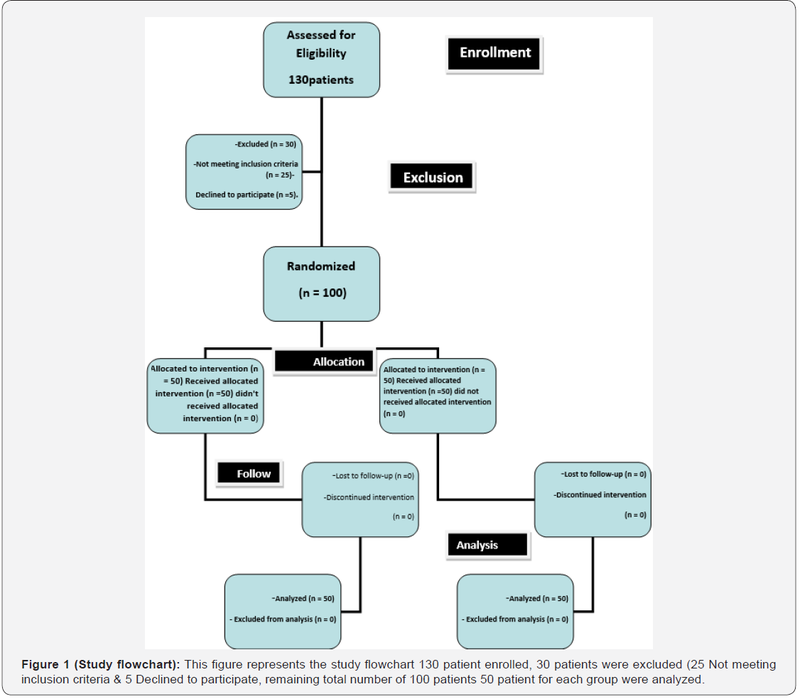 After pilot study of 40 cases 20 for each group, sample size obtained using G power program total number of 100 patients 50 patient for each group, patient enrolment, exclusion, and group allocation was clarified in the study chart (Figure1). Patients were allocated randomly by drawing sequentially numbered sealed opaque envelopes contained a softwaregenerated randomization code to receive either Group F or Group MF. All patients were ASA I-III. Airway criteria: should be of both Modified Mallampati (NT-MMT) Airway score III, or VI with thyromental distance ≤ 5cm (PDEtt), both sexes, aged 18 to 65 year’s old, Scheduled for elective oncology surgery under general anesthesia. Exclusion criteria: Patients with preoperative hemodynamic instability or heart failure, pulmonary diseases pregnancy. Suspected cervical fracture, Deformities of the tongue, mouth, mandible, larynx and maxilla, Prior history of surgery in these regions. Morbid obese BMI> 35, obstructive sleep apnea patients. History of malignant hyperthermia, and allergy to general anesthetics or opioids. Airway of the Patients was evaluated using NT-MMT by anesthetists who were not involved in airway intubation at the preoperative examination, all patients fasted 6 hours for solid and 2 hours for water before surgery, morning of surgery IV cannula was inserted in the ward before sending the patient to operative theater then preloading with 500 ml Normal saline IV infusion, Glycopyrrolate (7μg/kg IV) was given 20 minutes before airway management for suitable clear dry vision and better quality of topical anesthesia during FVFOB. Sterile FVFOB was attached to electric power light source vision clarity, anterior and posterior tip movement checked, portex Ett (7.5 mm ID in males, 7 mm in females) railroaded over it. Sterile FVFOB specific airway, Sterile Macintosh direct laryngoscope, its light source check, sterile effective suction machine with a sterile suitable suction catheter attached, size 3 and size 4 sterile laryngeal mask in case needed. In the recovery room pulse oximeter O2 saturation monitor was connected then Airway local anesthesia nebulization sitting Using lidocaine 1mg/kg of 2% lidocaine  solution nebulized over 5 minutes via electric nebulizer was done in semi-sitting position in the recovery room 20 minutes prior intubation over 5 liters O2/minute flow. In the operative room Patients were positioned in the flat supine neutral head position, Then basic monitoring devices were connected includes: Non-invasive blood pressure cuff, Electrocardiography (ECG), pulse oximetry and End tidal Co2 (EtCo2) side-stream Capnogram connected to the oxygenation Mask-circuit complex, after that 1mg/kg lidocaine 2% solution gurgle for 60 seconds to throw out not to swallow The Anesthesiologists Position was arranged for both anesthesiologist to stand at the head of the patient with the assistant anesthetist stood on the left and the FOB intubating anesthetist will stand to the right. Patients were Pre-oxygenated for 5 minutes with normal tidal breathes of 6.0 L/min 100% O2 via tightly fitting face mask- Magill circuit (Mapleson A) with reservoir bag 2liters [6,7]. Anesthesia induction using single IV bolus of fentanyl (1 μcg/kg) after which sevoflurane inhalational induction (6-8%) was started using the semi-closed ventilator circuit carried over 100% O2 of 6.0 L/min till loss of consciousness with maintained respiratory drive occur. (Anesthesia depth and Loss of consciousness confirmed by mask end-tidal concentrations of sevoflurane just before successful tracheal intubations >4% , and loss of the lid-lash reflex) . Fiberoptic Intubation was conducted according each group as follow: Control Group(F) Done by two anesthetists; the 1st anesthetist (assistant) inserted sterile airway with head tilt- chin lift- jaw thrust and the 2nd anesthetist 2nd anesthetist (five years expert in FOB intubation with experience of successful 400 FOB oral intubations) did oral FVFOB along the FOB specific airway, jaw thrust was performed by placing the fingers behind the posterior ramus of the mandible, with the thrust directed upwards and the thumbs caudally. Study Group (MF) Done by two anesthetists; the 1st anesthetist (assistant) did Macintosh Laryngoscope laryngeal exposure with size III blade for all cases (size II blade to be ready in case needed for very short thyromental distance), the 2nd anesthetist ( five years expert in FOB intubation with experience of successful 400 FOB oral intubations) did oral FVFOB by introducing the FOB to the right of the pre-inserted Macintosh laryngoscope blade and directed centrally targeting the laryngeal opening. After visualizing the glottis straight ahead in both groups; another topicalization sitting spray-as-you-go technique  of 1mg/kg lidocaine 2% via the FOB working channel to directly administer local anesthetic to supraglottic and glottic structures during advancement of the instrument, then a propofol bolus dose of 1mg/kg to ensure complete suppression of the airway reflexes and prevent any complications, then Fine adjustments with slight motion of the wrist and elevation or depression of the tip using the angulations (thumb) control lever aid in steering the scope toward the vocal cords, FVFOB was then introduced through the vocal cords visualizing the tracheal rings, to the level of the midtrachea (optimal tube positioning 2-3 cm above the carina), then tracheal tube was introduced over the FVFOB shaft into the trachea (Ett should be turned gently counterclockwise with retraction and then re-advanced if resistance is encountered during placement to decrease the occurrence of laryngeal trauma . a. Failed FOB intubation cases were managed as follow: (failed intubation was defined as); Case exposed to 3 trials of FOB intubation with insertion time (IT) 90 second for each trial and couldn’t be intubated. Any complication leads to failed intubation 3 trials to be reported and excluded from the study and replaced by another case. b. Prevention: Sufficient inhalational anesthetic depth (MAC>1.5) to ensure airway reflexes suppression. e. Plan B: Face mask ventilation if ventilating wakes the patient, can’t intubate can’t oxygenate (CICO) go for plan C. f. Plan C: Emergency front of the neck access (cricothyrotomy). Cases with Laryngospasm management  with hydrocortisone 1mg/kg bolus, Application of CPAP with 100% oxygen. I.V. propofol (0.5 mg kg) increments if not effective Succinylcholine1mg/kg to be given. Cases with Bronchospasm management  increase anesthesia depth, if ventilation through ETT difficult/impossible, check tube position and exclude blocked/misplaced tube, in non-intubated patients exclude laryngospasm and consider aspiration. Drug therapy Magnesium sulphate 50mg.kg-1 IV over 20min (max 2g), Hydrocortisone: 200mg IV 6 hourly Ketamine: Bolus 10-20mg. Infusion 1-3mg.kg, in extremis: Epinephrine (Adrenaline) Nebulized: 5mls 1:1000 or Intravenous 10mcg (0.1ml 1:10,000) to 100mcg (1ml 1:10,000) titrated to response. Endotracheal intubation insertion time (EttIT), defined as Time from introduction of the tip of the FOB laryngoscope till carbon dioxide appeared on the capnography after intubation with ETT in the laryngeal inlet down to the trachea. a. Modified Mallampati = (III=1, IV=2). c. Jaw relaxation = (Relaxed = 0, not fully =1, poor = 2). d. Resistance to FOI (no= 0, slight =1, active = 2). e. Vocal cord position (Abducted=0, Intermediate=1, Closed=2). 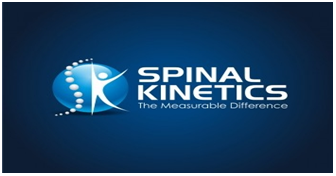 f. Neck movements during ETT positioning or cuff inflation= (no=0, slight=1 vigorous=2) . Trials success rate = number of patients intubated within the 1st 90 seconds in each group. 2-Failed ETT intubation > 270 seconds (3 successive FOB intubation separate trials 90 seconds each on 3 time separated by oxygenation). Systolic Noninvasive Blood Pressure (SNIBP) measured Every 1 min, Heart Rate (HR) both SNIBP and HR were recorded basal and just after ETT in the trachea, and EtCO2 when detected to be recorded. Desaturation ≤90%. (Yes=1, No=0). End tidal Co2 (EtCO2) after intubation. The Sample size was calculated Using G Power program. Based on pilot study of 40 patients 20 for each group (as no previous study compared combined use of FVFOB and Macintosh laryngoscope in PDEtt cases.) yielding an, Effect size d=0.6676508, α error= 0.05, Power (1-β error) =0.85. Result in Sample size lower limit of 42 for each group which hence 50 patients were assigned for each group with Total sample size=100 patients and consequently 130 patients were enrolled to compensate dropped cases. Data were analyzed using SPSS software (version 16.0 for Windows; SPSS Inc., Chicago, IL, USA). The data was tested for normality using the Shapiro test and Kolmogorov-Smirnov test. Descriptive data were calculated for all variables (qualitative) that were presented as frequencies and percentages, the analytic data was expressed as means and standard deviation (M±SD), median and range (M&R). Independent sample-t-test was used for comparing the continuous parametric variables and, Chi-square test or Fisher’s exact test (for categorical data). The statistical significance level was set at ≤ 0.05 and highly statistical level was set at ≤ 0.01. 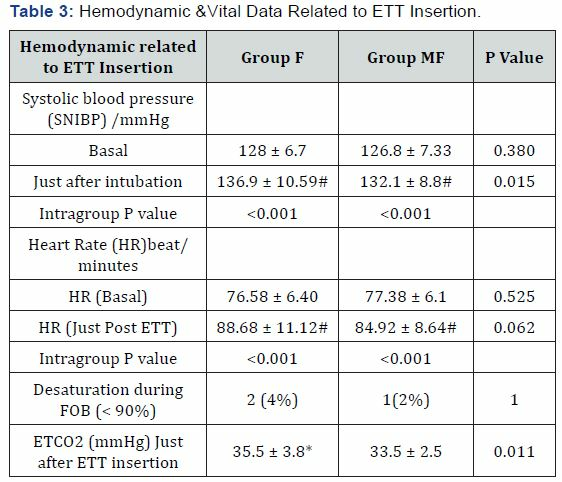 In this present study, intubation technique conditions (Table 1) showed significant decrease in EET insertion time in Group MF (32.1 ± 7.9 seconds) compared to Group F (68.6 ± 12.6 seconds) P<0.001, significant increase in 1st trial success in Group MF 49 (98%) compared to Group F 43 (86%) P=0.008. Intubating conditions scoring (Table 2) showed no significant difference in between groups as regard jaw relaxation, neck movement, and air way resistance to ETT, vocal Cord position, and ETT induced coughing. Hemodynamically (Table 3) there were significant increase in NISBP&HR readings just after ETT in comparison to the basal reading inside each group with no significant difference as regard desaturation during Ett and EtCo2. 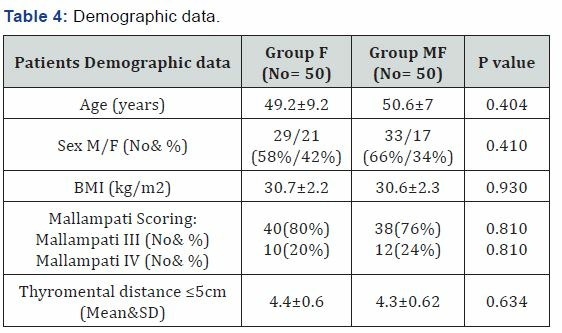 Patient demographics (Table 4) showed no significant difference in between groups including Modified Mallampati score, and Thyromental distance. Failed FOB intubation cases (8 cases for both groups), cases with side effects and complications such as desaturation (3 cases for both groups) were managed according to (ABCD) discussed before in the methodology. No previous clinical study analyzed the effect of Combined Macintosh laryngoscope with Flexible FOB in PDEtt airways, so that we carried out a pilot study to calculate a statistically effective sample size. In this present study, we hypothesized that combined use of Macintosh laryngoscope with the FVFOB could be feasible and safe technique that facilitate the FOB intubation function in PDEtt. Difficult airway prediction and the device used instead of Macintosh laryngoscope still a critical issue, despite the fact that el Ganzouri risk index high accuracy in PDEtt and the advanced video laryngoscopy technology both improved laryngeal structures visualization . Difficult Airway Society 2015  for management of PDEtt in adults advised Video laryngoscope as the first choice . Flexible FOB laryngoscope remains the gold standard tool in intubating predicted and unpredicted difficult airway situations. Incidence of difficulty in passing a tracheal tube over an orally inserted FOB varies considerably between studies, so that the need to improve Feasibility and success rate of flexible FOB stay challenging all the time. The present study showed significant decrease (near 50% reduction) in EET insertion time in Group MF (32.1 ± 7.9 seconds) compared to Group F (68.6 ± 12.6 seconds) P<0.001, significant increase in 1st trial success in Group MF 49 (98%) compared to Group F 43 (86%) P=0.008 higher than previous studies [18,19] done on flexible FOB laryngoscope alone, this can be explained by the fact that Macintosh blade prevented the backward displacement Oropharyngeal structures such as the tongue, soft palate and epiglottis which may close the airway during FOB intubation. Previous study on FOB alone in difficult intubation patients such as, Calogero et al. (2015)  reported that FOB 1st trial success of (92.6%) in PDEtt patients, Salma et al. 2015  reported a FOB success rate of (73.3%) and EttIT (62.97 ± 37.5 seconds), meanwhile in our present study adding Macintosh blade before FOB has lowered the tracheal tube insertion time down to 32.1 ± 7.9 seconds (nearly 50% less) and increased the intubation success rate Group MF 98% in comparison to the previous studies[3,20] results indicating great feasibility of combined use of FOB and Macintosh laryngoscope during difficult intubation conditions. As regard comparison to other airway devices combinations with FOB: All the previous studies were done for non-difficult airway patients, except Aziz et al. who documented 93% first attempt success rate in predicted difficult airway, a result lower than our result (98% 1st attempt success rate), Moore et al. showed a high success rate (96%) of the same intubation technique in morbidly obese patients. Gupta et al. , documented that, during intubating highly seated larynx the Combined Flexible FOB simultaneously with C-MAC VLS enhanced visualization of intubation field and decreased chances of trauma to delicate soft tissue structures. Our opinion is that all operative theaters all over the world may not have both C-MAC and FOB laryngoscope at the same time but Macintosh laryngoscope is popular present every were, cheap, and widely used as primitive goldstone tool for classic Ett that guarantee airway opening with wide space view prior the entrance of the flexible FOB laryngoscope which is also the goldstone basic tool for predicted difficult endotracheal intubation which is the field of our study. All the previous mentioned studies airway intubating techniques were comparable to our technique results regarding tracheal intubation success rate and insertion time. The reliability of rigid video laryngoscopes in difficult airways, Niforopoulou et al. postulated that despite clear glottis visualization, tracheal insertion of the Ett with video laryngoscopes may fail, in our present study combined FVFOB (which guarantee Ett advancement over its shaft with the aid of the FVFOB tip upward movement ability to reach the highly seated larynx) with Macintosh laryngoscope blade pre-exposure (which could guarantee better airway opening and rapid glottis access during Ett insertion). Inhalational anesthesia with airway LA topicalization and fentanyl analgesia without IV muscle relaxants, maintain the respiratory drive without exposing the patient to the stress of the awake airway instrumentation despite that, still has the drawback of unpredictable effect on the patient respiratory drive when used in not enough or more than enough doses, despite that we can control the dose, concentration, and delivery rate of the inhalational drug guided by the end tidal sevoflurane concentration if bispectral index is not available. In line with our anesthesia induction technique, Tan et al. documented that sevoflurane combination with remifentanil anesthesia induction for FOB intubation, provided fast induction and good intubation condition with stable hemodynamics. Long time back, Stacey et al. used FOB with Macintosh laryngoscope but in normal- non-difficult airway patients and found a clear airway in 92% of the patients at the level of the larynx. On the other hand, Johnson et al. published a case report advised that Macintosh laryngoscope could help during FOB intubation during difficult airway conditions. Up till now this is the only clinical research studied the value of combine FOI with Macintosh laryngoscope in difficult intubation predicted airway. FOB intubation has three steps; visualization of the glottis with FOB, passing the FOB through the glottis into trachea till carina, and lastly railroading the Ett over the FOB into the trachea . Backward displacement Oropharyngeal structures may close the airway adding difficulties during FOB under general anesthesia. Using airways, lingual traction and jaw thrust are the maneuvers that may help to overcome this problem. Difficult Airway intubation tool that guarantee the best airway opening simultaneously with glottis opening easy rapid access would be the most ideal, and this could never be achieved by using single instrument. Clinical implications supporting the hypothesis: A comparable application to our technique is that of the Sensa Scope®, a hybrid intubation endoscope which guarantee safety, easy-to-handle, and effective video-assisted intubation. Has combined rigid and flexible parts. Its S-shaped rigid segment enables a very intuitive handling by one hand only, thus leaving the left hand free to operate a conventional laryngoscope. The device tip can be controlled via a steering handle same as FOB. Its Ett insertion success rate is 97% nearly similar to our intubation success rate in this present study (98%) . a. Patients with Cervical spine instability or trauma may not benefit from this technique as it does not guarantee cervical vertebra immobility due to upward curved Macintosh blade, in opposition, Yumul et al. advised that C-MAC is superior to fiberoptic flexible laryngoscope as regard the time required to obtain glottic view and successful placement of the tracheal tube in patients requiring cervical spine immobilization. b. No available Bi-spectral index in the hospital (anesthesia depth detector) so we used end tidal sevoflurane concentration and lid lash reflex. c. General anesthesia induction technique in our study utilizing inhalational sevoflurane avoiding IV muscle relaxation still has the drawback of unpredictable effect on the patient respiratory drive when used in not enough or more than enough doses even so still in hand as we can control the dose, concentration, and delivery rate of the inhalational drug using end tidal sevoflurane concentration >5.5% and lid lash reflex if bispectrality index is not available. d. Still we can’t guarantee 100% difficult airway prediction while using two or three scoring airway systems, so we used an internal scoring system NT-MMS and an external scoring system thyromental distance to predict as far as possible the difficult airways to be included in our study. e. This muscle relaxant free technique may be of less comfortable to the intubator but provided a totally accepted intubation circumstances, patient safety depending on the maintained respiratory derive all over the technique. The combined use of Macintosh laryngoscope with the flexible FOB in predicted difficult endotracheal intubation conditions provides significant decrease in endotracheal tube insertion time (near 50% reduction), significant increase in 1st endotracheal intubation trial success rate, acceptable intubating conditions and hemodynamic stability compared to flexible FOB alone. Stephen R Collins (2014) Direct and indirect laryngoscopy: equipment and techniques. Respiratory care 59(6): 850-864. Yozo Manabe, Shigeru Iwamoto, Hiroshi Miyawaki, Katsuhiro Seo, Kazuna Sugiyama (2014) Mallampati classification without tongue protrusion can predict difficult tracheal intubation more accurately than the traditional mallampati classification. Oral Science International 11(2): 52-55. Calogero Grillo, Francesco Sgalambro, Claudio Andaloro, Giuseppe Fugale et al. (2015) Flexible FOB Laryngoscope Guided Intubation in Difficult Oral Intubation. Acta Medica Mediterranean 31: 913. Mary Beth Shirk, Kevin R, Donahue, Jill Shirvani (2006) Unlabeled Uses of Nebulized Medications. Am J Health Syst Pharm 63(18): 1704-1716. Nibedita Pani, Shovan Kumar Rath (2009) Regional & Topical Anesthesia of Upper Airways. Indian J Anesth 53(6): 641-648. Lallo A, Billard V, Bourgain Jl (2009) A Comparison of Propofol and Remifentanil Target-Controlled Infusions to Facilitate FOB Nasotracheal Intubation. Anesth Analg 108(3): 852-857. Xue Fs, Liu Hp, He N, Xu Yc, Yang Qy, et al. (2009) Spray-As-You-Go Airway Topical Anesthesia In Patients With A Difficult Airway: A Randomized, Double-Blind Comparison Of 2% And 4% Lidocaine. Anesth Analg 108(2): 536-543. M Muzi, BJ Robinson, TJ Ebert, TJ O Brien (1996) Induction of Anesthesia and Tracheal Intubation with Sevoflurane in Adults. Anesthesiology 85(3): 536-543. Hillman, Walsh Jh, Maddison Kj, Platt Pr, Kirkness Jp, et al. (2009) Evolution of Changes In Upper Airway Collapsibility During Slow Induction Of Anesthesia With Propofol. Anesthesiology 111(1): 63-71. Collins Sr, Blank Rs (2014) FOB Intubation: An Overview and Update. Respir Care 59(6): 865-878. Hakala P, Randell T (1995) Comparison between Two Flexible FOB Laryngoscope with Different Diameter Insertion Cords for FOB Intubation. Anesthesia 50(8): 735-737. Frerk C, Mitchell VS, Mcnarry AF, Mendonca C, Bhagrath R (2015) Difficult Airway Society 2015 Guidelines for Management of Unanticipated Difficult Intubation in Adults”. British Journal of Anesthesia 115 (6): 827-848. Chiara Robba, Ega Qeva, Beatrice Borsellino, Simone Aloisio, Giulia Tosti, et al. (2017) Effects of Propofol Or Sevoflurane Anesthesia Induction On Hemodynamics In Patients Undergoing FOB Intubation For Cervical Spine Surgery: A Randomized, Controlled, Clinical Trial.” Journal of Anesthesiology Clinical Pharmacology 33(2): 215-220. Gil Gavel, Robert WM Walker (2014) Laryngospasm in anesthesia. Continuing Education in Anesthesia Critical Care & Pain 14(2): 47–51. Dario Caldiroli, Paolo Cortellazzi (2011) A New Difficult Airway Management Algorithm Based Upon The El Ganzouri Risk Index and Glidescope® Videolaryngoscope. A New Look for Intubation. Minerva Anestesiologica 77(10): 1011-1017. Brampton W, Halai M, C Hoy, Lee E, Scott I, et al. (2009) Randomized Controlled Trial of Intubation with The Mcgrath Series 5 Videolaryngoscope By Inexperienced Anesthetists. Br J Anesth 103(3): 440-445. Asai T, Shingu K (2004) Difficulty in advancing a tracheal tube over a fibreoptic bronchoscope: incidence, causes and solutions. BJA: British Journal of Anesthesia 92(6): 870-881. Barker KF, Bolton P, Cole S, Coe PA (2001) Ease of laryngeal passage during fibreoptic intubation: a comparison of three endotracheal tubes. Acta Anesthesiol Scand 45(5): 624-626. Salama Ak, Hemy A, Raouf A, Saleh N, Rady S (2015) C-Mac Video Laryngoscopy versus Flexible FOB Laryngoscopy in Patients with Anticipated Difficult Airway: A Randomized Controlled Trial. J Anesthesia Patient Care 1(1): 101. Aziz MF, Dillman D, Fu R, Brambrink AM (2012) Comparative effectiveness of the C-MAC video laryngoscope versus direct laryngoscopy in the setting of the predicted difficult airway. Anesthesiology 116(3): 629-636. Moore AR, Court O (2012) Awake video laryngoscopy-assisted tracheal intubation of the morbidly obese. Anesthesia 67(3): 232-235. Anand Gupta, Dheeraj Kapoor, Meenakshi Awana, Gurvanit Lehl (2015) Fiberscope Assisted Video Laryngoscope Intubation in the Surgical Treatment of Tmj Ankylosis. J Maxillofacial Oral Surg 14(2): 484-486. Niforopoulou, I Pantazopoulos, T Demestiha, E Koudouna, T Xanthos (2010) Video‐Laryngoscopes in the adult airway management: A Topical Review of The Literature. Acta Anaesthesiol Scand 54(9): 1050-1061. Tan HY, Cao LH, Huang W, Zhong ZJ, Lin WQ (2010) Comparison of sevoflurane and propofol in combined anesthesia induction with remifentanil for tracheal intubation with FOB bronchoscope. Nan Fang Yi Ke Da Xue Xue Bao 30(8): 1857-1859. MR Stacey, S Rassam, R Sivasankar, JE Hall, IP Latto (2005) A Comparison of direct laryngoscopy and jaw Thrust to aid fibreoptic Intubation. Anesthesia 60(5): 445-448. Johnson C, Hunter J, Ho E, Bruff C (1991) FOB intubation facilitated by a rigid laryngoscope. Anesth Analg 72: 714. Elangovan Muthukumar, Lenin Babu Elakkumanan, Prasanna Udupi Bidkar, Mvs Satyaprakash, Sandeep Kumar Mishra (2017) Evaluation of Simple Pre-Determined Length Insertion Technique (Split) With Conventional Method for Oral Fibreoptic Intubation: A Randomized Cross-Over Study. Indian J Anesth 61(1): 36-41. Biro P The SensaScope- A new hybrid video intubation stylet. Saudi J Anaesth 5(4): 411-413. Yumul R, Elvir Lazo Ol, White Pf, Durra O, Ternian A, et al. (2016) Comparison of the C-Mac video laryngoscope to a flexible FOB scope for intubation with cervical spine immobilization. J Clin Anesth 31: 46- 52.